It is a good "insulator"
Have a "Thick upper coat"
From heat from the sun. Reduces "Water loss from sweating". Thorns are a good source of "Water". This keeps dust out of their "eyes"
This keeps dust out of their "Nose". This prevents Camels "Sinking" in the sand. 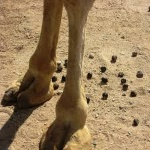 Camels have a hump in one place. Allowing heat loss from other parts of its body. Reducing "Water loss from sweating"
It can be converted to water. Insulation means "making warmth and trying to keep it."